There’s no question that rivers are majestic. It’s hard not to fall in love with the powerful way they carve deep canyons through rugged terrain, the tenuous way they hold and sustain life. And yet, these great forces are threatened. Climate change is hard to predict, but estimates say river flows can decrease by half within the next hundred years. Our water allocation system is inching toward a breaking point because more water is allocated than is available; the growing population of the West adds even more strain on that demand. Additional threats include the possibility of pollution from oil and gas drilling with potentially devastating effects to the ecosystem and down the chain—not to mention a buildup of litter and trash from those who don’t follow the rules. 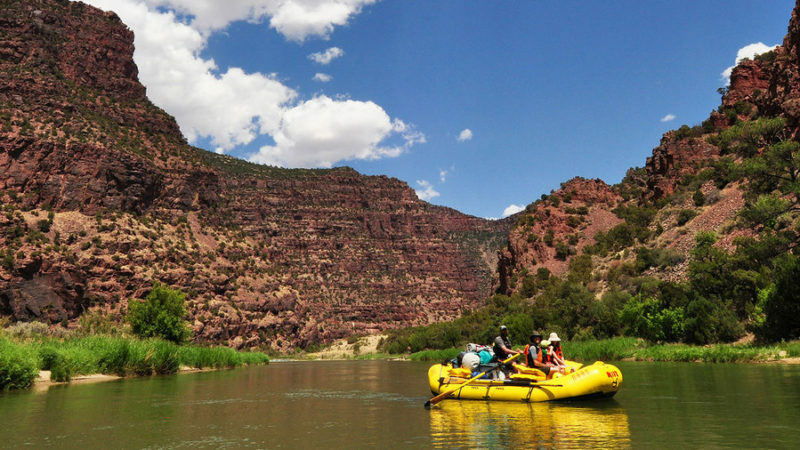 Through the book (March 2019), author Heather Hansman wants her readers to connect the dots between water use, natural resources, and human impact: “We must change the way we think about and use water.” She chronicles a long rafting trip on the Green River (pictured at top), the greatest tributary to the Colorado River, from the alpine peaks to grasslands and on to the canyons of the desert. The Green provides water for 33 million people but is overused, threatened by climate change, and at risk. Hansman hopes her adventure inspires others to experience our rivers, even if just for a short float or paddle trip, and to see the water system from the river’s perspective. The lowest-impact river trip is one that is all human- and river-powered and leaves no trace. If you’re considering a trip across protected areas, the permitting system is designed to be low impact so that only certain numbers of people are allowed on the water at a time. Those locations will most likely require you bring along a “groover”, a portable toilet in a box, because rules dictate that you must pack out everything, including human waste. Rent one if you’re with a group or use on a solo trip. And in general, leave the river better than you found it by cleaning up after yourself and picking up others’ trash. Unlike backpacking, rafting allows you to carry a lot on the boat and nothing on your back. You’re able to bring better food and can pack a few non-essentials. Hansman recommends a for easy day accessibility, a quick-drying designed for keeping the sun off, and that stay on your feet. Other good ideas include a to keep sunglasses from falling off, a comfortable and waterproof if you’re on a multi-day trip, and a battery and solar charger if you plan to bring electronics. Once your trip is complete and you’ve been moved by the beauty and fragility of a river, you might be motivated to get involved. Contribute to river sustainability by supporting a nonprofit like or . Attend river cleanups sponsored by local nonprofits and get information about policy projects. Educate yourself about the big picture: find out where your water comes from and where it goes when you’re done with it.